This blog post was written by CGEE Instructor and Program Coordinator in Central America (Nicaragua), Elisa Vanegas. View the course and enroll today online at our Global Gateway! When I was offered the opportunity to teach an online course on the Nicaraguan crisis, I felt a kick in my stomach. As a Nicaraguan experiencing the turn of events, I felt it would be very difficult, maybe even impossible, to remain unbiased. However, before I knew it, a YES slipped through the corners of my lips. All the while, beginning to feel uncertain, like the future of my country, on how I would even design this course. As I sat in front of my computer, I began to look at the books on the shelves of Central American History, and had long talks and sharing of ideas with my CGEE colleagues; and then it came to me: The truth, that is what I had to teach. But the essence of that truth is not something one can define within a simple sentence, especially when it involves deconstructing a country’s history. Knowing the truth is about being able to analyze and comprehend the complexity of events that shed some light on, in this specific case, the current Nicaraguan Crisis. Elite and military rule, US interventions, and a Popular Revolution are all part of Nicaragua’s past and surprisingly, it’s present. As Nicaraguans on both sides of the conflict today try to look back at history to validate their position and find meaning in their struggle. I, myself had a very hard time dealing with my own contradictions. Coming from a family that fought in the Revolution led by the FSLN in 1979, and being named after my mother´s war alias, there comes a time where your values outweigh the ideologies you become accustomed to. Henceforth, I have chosen my own path, as many other Nicaraguans have, understanding that we can build a different and better country than the one we have always known. It was not an easy task to put this course together. Exploring the truth involves hearing both sides of the tale, bringing in opposing arguments, perspectives, and world views. As difficult as it may seem, it is necessary because uncovering the truth can only be achieved by challenging those deemed glorious while giving a voice to those unheard. I believe that this History course has a particularity that I personally like, because while reflecting on the past, you also see it projected in the present. It is as if history is being made and you are there, witnessing it all, talking with the protagonists and having a firsthand experience of an event that may change the lives of millions of Nicaraguans and have an impact at regional levels. So, yes, this is a course of a history in the making, about an ongoing event within a dismantled country. A history of a nation seen through the eyes of the youth today. Eyes that look towards hope in Nicaragua as paradigms shift towards a new political culture. Enroll today for Elisa’s Course “The Crisis in Nicaragua: U.S. Destabilization or a Democratic Movement?”. This course is taught online and is open to everyone. Both for-credit and audit options are available. 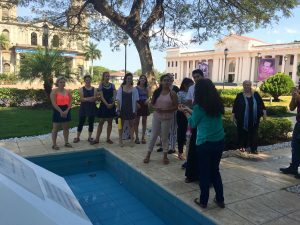 Course content includes exclusive interviews and virtual sessions with current Nicaraguans, experiencing the new social movement in real-time, as well as those that fought in previous conflicts.